BRUSSELS, WILLEMSTAD - As the Public Prosecutor’s office in the Netherlands takes steps to reopen an investigation into the company’s involvement with a historical Curaçao government scheme to recycle asphalt into oil, Oilchart reiterates that Belgian authorities confirmed the product it imported into Europe was not waste. ‘We will cooperate fully with the judicial investigation; it is business as usual for Oilchart International and Oilchart Offshore,’ says the company. Reports in the local media have raised a question mark over Oilchart’s earlier involvement in a Curaçao government initiative to remove an ‘asphalt lake’ on the island, which was the legacy of the operation of a Shell refinery at Buska Baai which produced fuel stocks for the Allies during World War II. 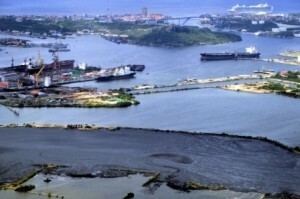 The environment division of the Public Prosecutor’s office has decided to revisit the project, which involved the recycling of asphalt into oil product, and Oilchart has issued a statement to clarify its position in terms of the importation of the product for introduction into the marine fuel chain. The company notes that it purchased some of the oil resulting from the recycling process, to which was added lighter certified oil fraction to bring the product into line with official standard No. 6 Fuel Oil. The product was then brought into Europe through a port in Belgium where it was further processed to meet the ISO 8217 marine fuel standard or sold on to other European refineries after the verification of relevant analysis reports. Oilchart also notes that a number of Belgian authorities have all confirmed that the oil product imported by the company from Curaçao is not a waste product. These entities include the Crown Prosecution Service (Openbaar Ministerie), the Environmental Standards Agency (Afdeling Milieuhandhaving), the Flemish Minister for Environment, the Flemish Public Waste Corporation (OVAM) and the Antwerp Department of Environmental Inspections (Milieu-Inspectie Antwerpen). The importation of the product which is the subject of the renewed investigation occurred between 2012 and 2015; it is not an ongoing situation, says Oilchart. The company confirmed that its directors have been interviewed by a representative of the Public Prosecutor’s office. Commenting, the company said that: ‘Oilchart International has in all respects acted with probity in adherence to applicable laws and in consideration for the environment.